One-on-one writing sessions are planned after a small pre-evaluation. You can expect to be trained on how to organize your thoughts and polish every piece of your writing. 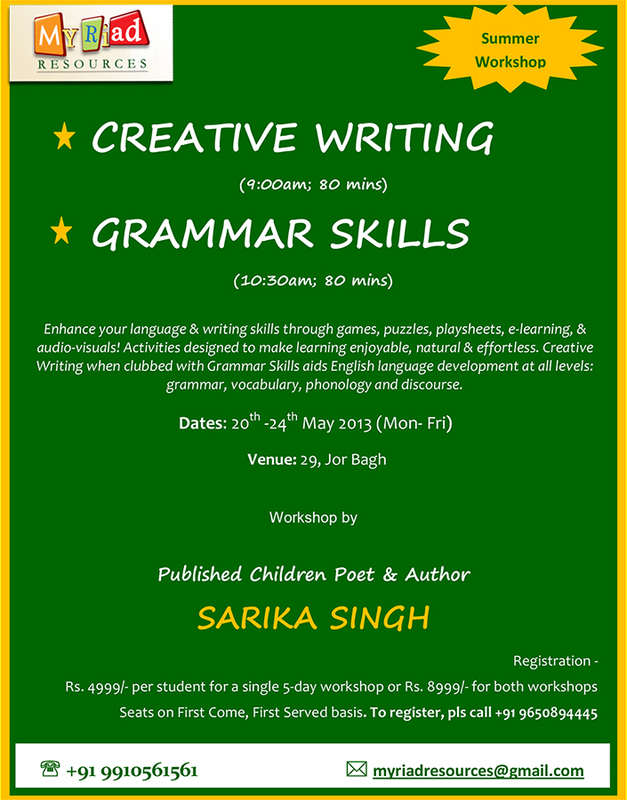 Trainings are available in the various literary genre- whether it is poetry or story writing or any other. .......There’s a lot more than this though. Each program is unique since it is personalized for the group and hence the workshops are not competitive! Even though I undertake personal trainings, I believe collaborative learning always helps. Through group dynamics, imaginative prompts and role-playing exercises, children learn the elements of creative writing much faster and put their inspirations on paper rather effortlessly. They gain confidence in a pleasurable and non-judgmental setting where each kid supports the other’s ideas, appreciates and sets a pace for the rest of the group. Home writing is suggested but not mandatory.